eCigs HQ: SmokeTip Thanksgiving Sale! Home » e-Cigarette Special Offers » SmokeTip Thanksgiving Sale! Offer good thru Cyber Monday, November 26th, 2012. SmokeTip says “Big Thanks!” to you with this Special Offer! As an extra-special way to show their gratitude to all their customers, SmokeTip is offering TWO of their 5-star Starter Kits for the price of ONE! 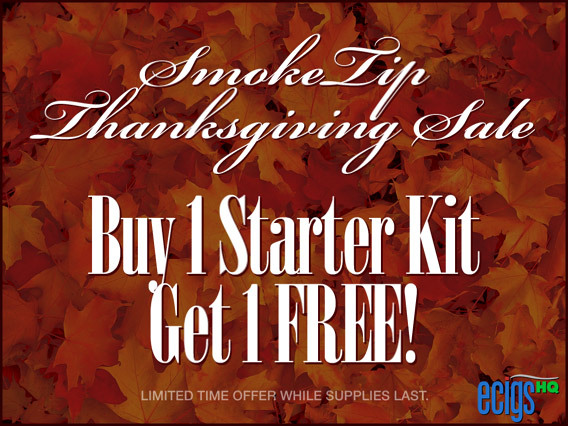 THANKSGIVING SPECIAL STARTER KIT OFFER IS GOOD FOR 8 DAYS ONLY — Monday November 19th through Monday November 26th, you can buy one SmokeTip Starter Kit and get a second Starter Kit FREE! Just put two SmokeTip Starter Kits into your shopping cart, and the discount will be automatically applied at checkout. No discount or coupon code is required. This offer can be shared with your family and friends, but you’ll need to act quickly before it expires. But most important of all, have a safe and joyous holiday season! To take advantage of the Thanksgiving Sale today, visit the SmokeTip website by clicking the banner above or the link below to receive one FREE Starter Kit with every Starter Kit order. Reviewed by Admin in e-Cigarette Special Offers | Comments Off on SmokeTip Thanksgiving Sale!